My parting views on MCHP’s pending acquisition of ATML. The $3.5 billion acquisition offers a return on capital in the low-single digits. ATML has rapidly shrinking revenues. However, MCHP has plenty of cash. In spite of the lukewarm return projections, the ATML acquisition has little downside. I have written two articles questioning the decision by Microchip Technology (NASDAQ:MCHP) to acquire Atmel (NASDAQ:ATML). In those articles, I argued that the $3.5 billion acquisition represents a return on capital below 4%. I remain skeptical of the MCHP investor presentation, projecting upside synergies of over $170 million annually. 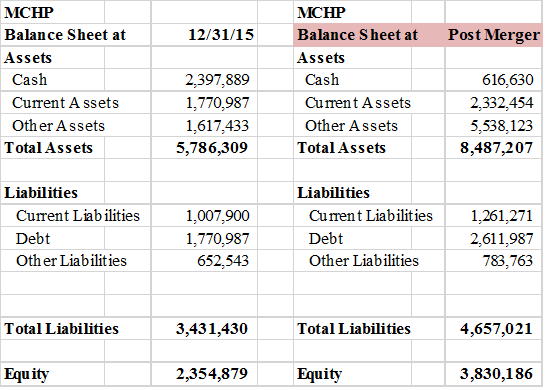 However, because MCHP has over $2 billion in cash on its balance sheet and consistently churns out over $500 million in cash flow after capital expenditures, I have concluded that the downside risk of the acquisition is limited. If the proposed synergies do materialize, there is upside potential for shareholders. At $42 per share, the market has assigned virtually zero value to the accretive nature of ATML’s $100 million of additional cash flow. Let me refresh readers on my journey: I have followed the remarks by Kyle Bass, George Soros, Jim Chanos, and others who are convinced that China faces a massive debt crisis. Looking for ways to short China, I noted that the semiconductor industry has significant exposure to the Chinese economy. However, I was astounded by the massive profitability of the sector and the lack of debt as I sifted through the numbers. 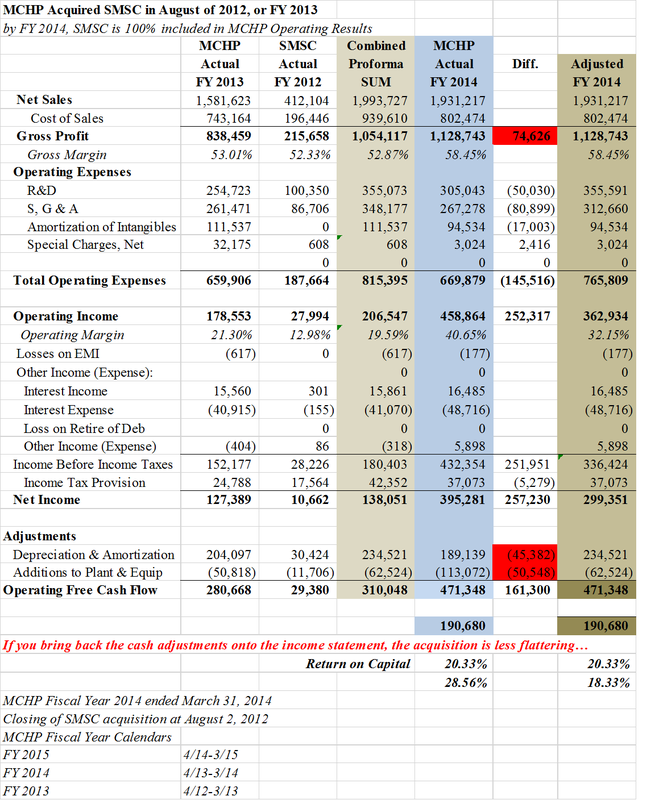 MCHP stood out with its $1 billion in debt to $2.35 billion in equity, so I decided to wade in. When MCHP announced the ATML acquisition in January, it struck me as a risky play. It is set to expand the company by over 50% (based on my estimate of combined revenues). The purchase price of $8.15 per share is approximately 100 times ATML earnings. Moreover, ATML has indicated that it will suffer a decline in revenues of 17% once 2015 numbers are tallied due to a sales slowdown in China. Finally, I showed that MCHP has been a successful acquirer of businesses in recent years, but not quite as good as it may lead investors to believe. 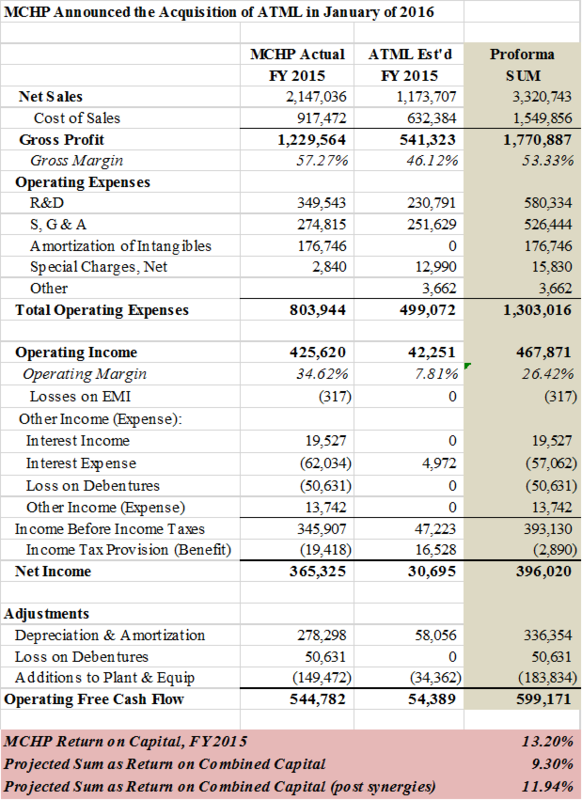 My view of the MCHP acquisition of Standard Microsystems (NASDAQ:SMSC) in August of 2012 showed that R&D and amortization expenses were probably understated by $95 million due to maneuvers on the balance sheet. 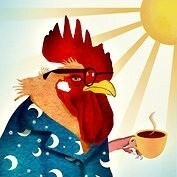 I am moving on in my search for short opportunities. While the debt levels of MCHP are higher than its peers, the acquisition of ATML offers little downside to a company generating over $500 million in cash annually and can boast a treasure chest that is more than adequate to cover the $2 billion cash portion of the ATML purchase. The additional 13 million shares to be issued will not be dilutive, and the additional $765 million in debt should be rapidly paid off. Using this definition of operating free cash flow, the projected return on capital for MCHP drops from 13.20% to 9.30% after the acquisition. However, if the proposed merger “synergies” enhance the cash flow, the return rises to nearly 12%. While I maintain my argument that this acquisition is not a stellar use of capital, commenters have reminded me that MCHP is effectively removing a major competitor from the market. This alone may be worth the price of admission. The final point (and, yes, this really is the final point! ): Anyone wishing to short the semiconductor sector based on a Chinese slowdown may run into the risk of a floor on valuations effectively put in place by none other than the Chinese themselves. Seeing the healthy margins on semiconductors (over 40%) and the need to move capital into profitable industries quickly, the Chinese have been on an acquisitive spree. The province of Guizhou set up a JV with Qualcomm (NASDAQ:QCOM) in January in which the Chinese state will own 55%. The Taiwanese firm Powertech sold a 25% stake to Tsinghua Unigroup. Portions of STATS ChipPAC (OTC:SCIPF), NXP (NASDAQ:NXPI) and Fairchild Semiconductor (NASDAQ:FCS) have also been sold to the Chinese recently. Many more will follow. Could MCHP be a target? Additional disclosure: This is my third post on MCHP. Your comments, corrections, and input, and feedback are valued and encouraged. I am not a professional analyst and the projections enclosed represent my own interpretation of available press releases, SEC filings and other articles in the public domain. 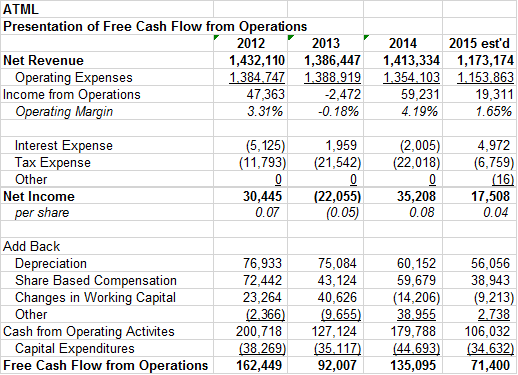 My measurements of operating cash flow and returns may differ from conventional metrics. Please do your own due diligence before making any decisions about taking a position in MCHP. Thank you.